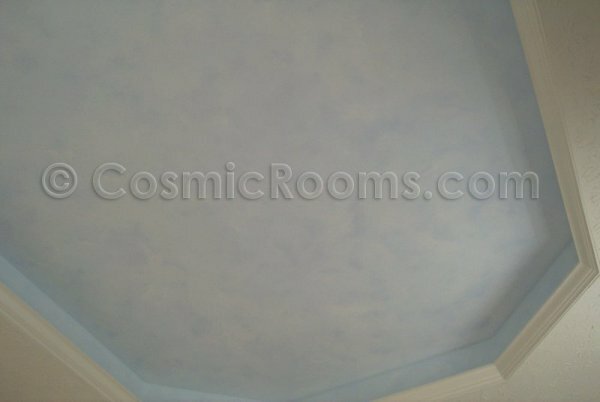 Your Tray Ceiling is the Perfect Frame for a Day and Night Combo Mural of Clouds and Stars! "That's what I'm talking about, it's exactly what I wanted to make my room a place I can relax" Marc B.
Tray ceilings are popping up more and more in nice homes. Most however are plain looking...my day/night combo is a perfect compliment to the already framed out tray ceiling! 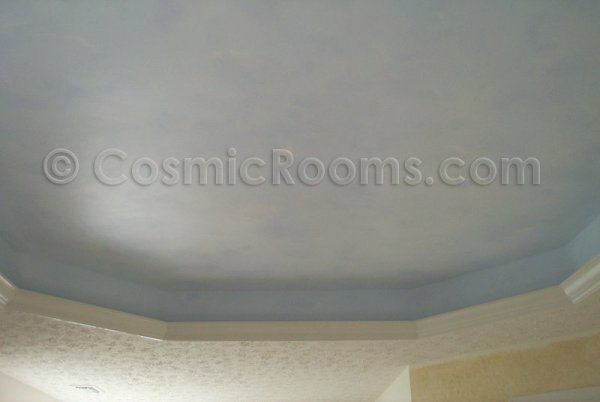 Take a look below to get an idea of what my murals can do to enhance your own tray ceiling. Move your mouse over the image of the clouds to see the dazzling view of the stars!! YOU can have this in your home too! 4 layers of colors in the creation of your daytime clouds give amazing depth! Soothing blue base accented by color washes of deeper blue, then clouds are built up in translucent layers plus highlights. Ceiling only. Contact Me for special deals. The most dazzling 3-D view of thousands of stars including two Shooting Stars! Different cosmic themes available. Contact Me for special deals. "I had no idea it would look so amazing, I'm truly in awe." Bryan K.